Mom, are we Native Americans or are we white demons? Ummm...Guess I need to do a little Pocahontas debrief. 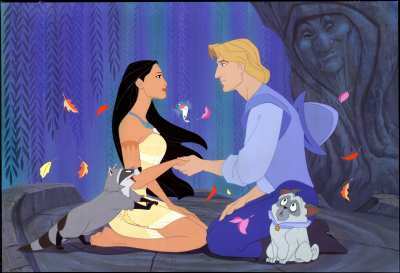 One of those Disney shows that show glorify history, personify the animals, deify the shrubbery,and Barbify the girl. Very funny, esp. the way she said it without a trace of irony. I'm reading "Guns, Germs, and Steel" right now, which is very illuminating on the whole discussion. Trinity and I will be discussing it when she's done reading it, tomorrow I expect. I read Bury My Heart at Wounded Knee last year and it answered Trinity's question. Nathan laughed a few years ago at a Hispanic family carrying an American flag and said, "They think they are American." We had a discussion about who were the immigrants and who were the native Americans. Just make sure to explain it too her in Disney fashion...in random song! Happy One Month Birthday, Fiona!